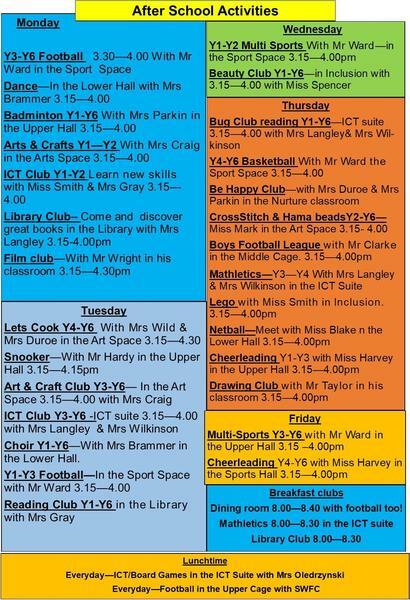 The school provide a wide variety of after school activities throughout the week. These run for half a term and usually finish between 4pm and 4:30pm. All after school clubs are very popular and there are limited places available. Letters are usually given out at the end of the half term for children to sign up for the new half term and will often be available from breakfast club and/or the main office.If your child would like to attend a club, parents/carers will need to collect and complete a letter from the main office and return. If your child has attended a club over a half term, they would not be allocated the same club for the following term.